Those feeling the warmth were the more than 400 guests who attended the 15th annual Palm Beach Hot Pink Luncheon & Symposium. Proceeds from the event, totaling $1,074,625 according to Leonard Lauder, BCRF honorary co-chairman and son of the late perfume and beauty products magnate, the esteemed Estee Lauder, a record-breaking sum for the region. The event was held at The Breakers Palm Beach and hosted by Aerin Lauder, with special guest Joan Lunden. The fundraiser has supported research grants in the areas of tumor biology, metastasis, heredity and ethnicity, survivorship, lifestyle and prevention and treatment. The Breast Cancer Research Foundation (BCRF) raised a record $1 million at its 15th annual Palm Beach Hot Pink Luncheon & Symposium on Feb. 8 at The Breakers. The benefit, hosted by Aerin Lauder and special guest Joan Lunden, drew more than 400 guests in support of research grants in areas including tumor biology, metastasis, heredity and ethnicity, survivorship, lifestyle, prevention and treatment. Lunden served as the keynote speaker Tuesday at the Massey Cancer Center's 23rd Annual Women & Wellness Breakfast and Luncheon at the Jefferson Hotel. Lunden beat breast cancer and shares her story and important information about breast density, a breast cancer risk factor, with Reba Hollingsworth. 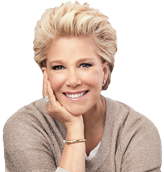 As National Family Caregivers Month comes to an end, television personality, award-winning journalist and long-time health advocate Joan Lunden joins us to offer her advice on how to cope while helping those you love. Parade caught up with Lunden, now three years post-breast cancer diagnosis and “NED” (with no evidence of disease), to discuss her new campaign At Home With Joan and her mission to empower women to become their own health care advocates. FOX's Tonya J. Powers spends "A Few Moments With..." with Lunden about the process she went through once she diagnosed with breast cancer. Forbes: Thousands of veterans and their spouses qualify for the Veterans Aid & Attendance long-term care benefit from the VA but don't know it. Here are the rules. When my mom’s dementia no longer made it possible for her to live alone, I began searching for an assisted living community. After I started working with an adviser from A Place for Mom — the senior-living referral service where I’m now a spokeswoman — I learned that my mother was eligible to receive Veterans Administration (VA) benefits that would help offset the costs of her care. My mother had remarried a man who was a World War II veteran (my dad died in a tragic plane crash when I was 13). I had no idea that as the widow of a veteran there was this kind of financial assistance. Patient Daily writes: Amgen recently launched At Home with Joan, a cancer information awareness campaign spearheaded by Joan Lunden, a breast cancer survivor and former co-host of "Good Morning America." Joan Lunden Talks Life After Battling Breast Cancer: "I'm Doing Fabulous!" Closer Weekly caught up with Joan at the Breast Cancer Research Foundation New York Symposium and Awards on Thursday, Oct. 19, where the former Good Morning America host spoke in support of her new purpose — advocating for breast cancer research and awareness. American Journal of Managed Care: Strong chemotherapy may be part of the treatment plan for patients diagnosed with cancer, but it also comes with risks. A new campaign will empower patients with cancer to better understand and navigate risks such as febrile neutropenia that are associated with strong chemotherapy. The campaign, At Home with Joan, is being led by Joan Lunden, a breast cancer survivor, advocate, and former co-host of ABC’s Good Morning America. After spending years working as a journalist and oftentimes covering health, Joan Lunden was shocked how much she didn’t know about breast cancer when she was first diagnosed. To help others dealing with breast cancer, Lunden has created At Home With Joan, a website dedicated to all things cancer-related, including everything from everyday tips to stories from survivors and thrivers to a printable guide you can take with you to the doctor to make sure you ask the right questions during your appointments. Joan Lunden -- co-host of "Good Morning America" for nearly two decades and a long-time health advocate -- is now also a breast cancer survivor. By sharing her experience and launching her new campaign "At Home with Joan," Lunden hopes she can help other women facing a frightening cancer diagnosis. Joan Lunden and Hoda Kotb attend the Breast Cancer Research Foundation 2017 Symposium, which raised almost $2.5 Million for breast cancer research. Three years ago, Joan Lunden told the world she had breast cancer. Tonight, she shares the details of her battle, her survival and her new campaign, "At Home with Joan." We sit down with Joan Lunden to talk about her newest breast cancer initiative "At Home With Joan"
Breast cancer survivor Joan Lunden and Oncology nurse Tina Pryor are chatting with Paul about ways those diagnosed with cancer can go into the situation feeling a sense of empowerment. Joan also tells us about her new project, At Home with Joan.